TL;DR: For the solution, click here. There are some other details, outlined here, but the above are the ones I care about most. I couldn’t display my “likes” in the sidebar if this were a secondary blog. Critically, you cannot change which blog acts as your primary blog, so if you mess up (like I did) you’re kinda stuck. Kinda. Ack! Looks like Tumblr is being protective of their /post/1234 URL format. They don’t want you to define a static page (or redirect) whose URL could conflict with the URL of a regular Tumblr post. Understandable. But now I have dilemma. 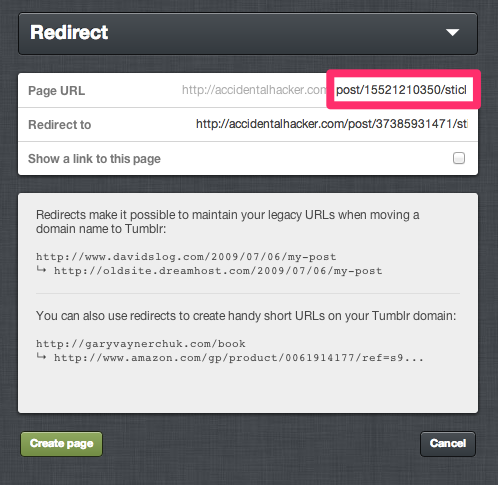 All the inbound links (and Google SERPs) point to the old Tumblr post URLs, which I cannot redirect on the server. 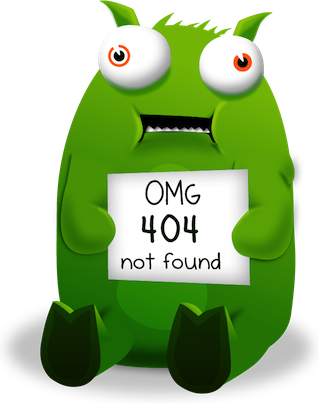 They generate 404s from the new blog now. Editing the old posts does no good because the accidentalhacker.com domain name no longer points there.